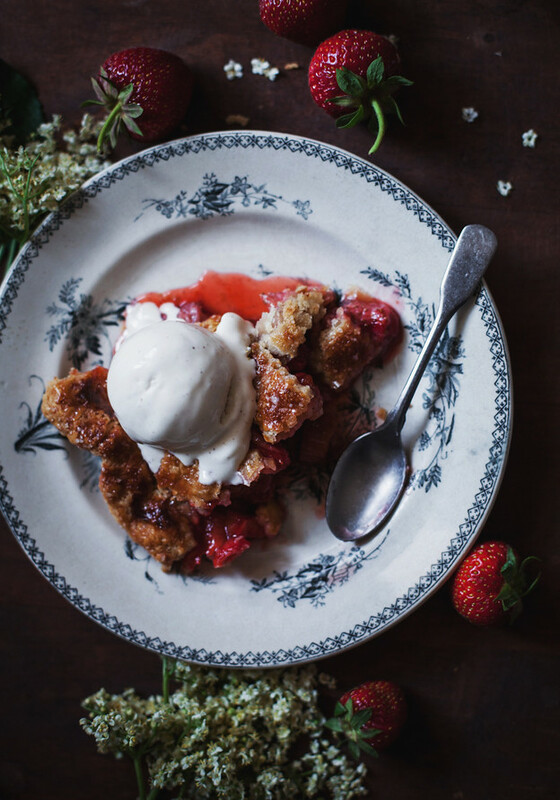 Strawberry rhubarb pie is one of those classics that I absolutely adore. And that’s exactly why I hesitated a bit before adding elderflowers to the mix. But I’m glad to say it turned out so well, with just a hint of elderflower flavor. Perfect. I know it looks like this pie has a huge puddle in the bottom, but it doesn’t, really. I was eager to photograph the inside and let it cool just 1 1/2 hours which is not enough to let it firm up completely.. I know, my bad. And it’s definitely not soupy like many other strawberry rhubarb pies I’ve tried. I macerate the fruit and then cook the liquids before I add them back to the pie (don’t want to lose any of that precious flavor!). I know it sounds like many steps to go through but I highly recommend trying it, to avoid a soggy pie bottom. And for those of you who are interested, I made a little lattice guide. Check it out below! Oh, and sorry for blocking the view with my head so many times.. hehe. Strawberry and rhubarb tend to release a lot of juice when baked, therefore, I macerate the fruit with sugar and flavoring so they release some of the liquid (and I tell you, it’s a lot! I probably had around 2 cups). I then cook the liquid with cornstarch until it thickens. This is to avoid a soggy bottom in a double crusted pie. The fruit also shrinks a little bit when doing this, so you don’t get that gap between the filling and the crust! Feel free to add another flavoring in place of elderflower. Cinnamon or cardamom would be delicious. 2. Drizzle with water, 1 tbsp at a time, and mix gently with a fork until dough just comes together, do not knead the dough! Pat the dough together, divide in half and flatten into two discs. 3. Wrap both pieces of dough in plastic wrap and place in refrigerator for at least an hour but preferably overnight. 1. Combine rhubarb, strawberries, sugar, lemon zest, vanilla, salt and elderflowers in a large bowl. Toss to combine. Cover and leave in room temperature for 30 minutes. Carefully toss every now and then. 2. Put a colander or sieve on top of a large non-reactive saucepan. Pour the filling into the colander and let stand for a few minutes until all the liquids have dripped into the saucepan. Put the berries back into the bowl and set aside. 3. In a small bowl, stir together cornstarch and lemon juice. Place the saucepan over medium heat and stir until it comes to a boil. Lower the heat and add the cornstarch slurry, stirring constantly until the mixture thickens. It should thicken quite a bit but still be a little runny, make sure it doesn’t turn into a paste! Leave to cool to room temperature, then add back to the berries. 1. Preheat oven to 225°C (430°F) with a baking sheet in the lower part of the oven (think of it like a pizza stone!). 2. If needed, leave the pie dough in room temp for a few minutes before rolling. Roll out one piece of the dough into a large circle on a lightly floured surface, about 1/8 – 1/4 inch (3-5 mm) thick. Make sure to roll and turn the dough so it doesn’t stick to the surface. Transfer to a 8-9 inch pie pan. Trim excess dough, leaving a 1 inch overhang. 3. Roll out the other piece of dough and cut into 12 long strips. 4. Spoon the filling into the prepared pan and place the strips in a lattice pattern on top (see video). Crimp the edges. 5. Put pie in the freezer for 15 minutes. 1. Mix the egg, a pinch of salt and milk in a small bowl. 2. 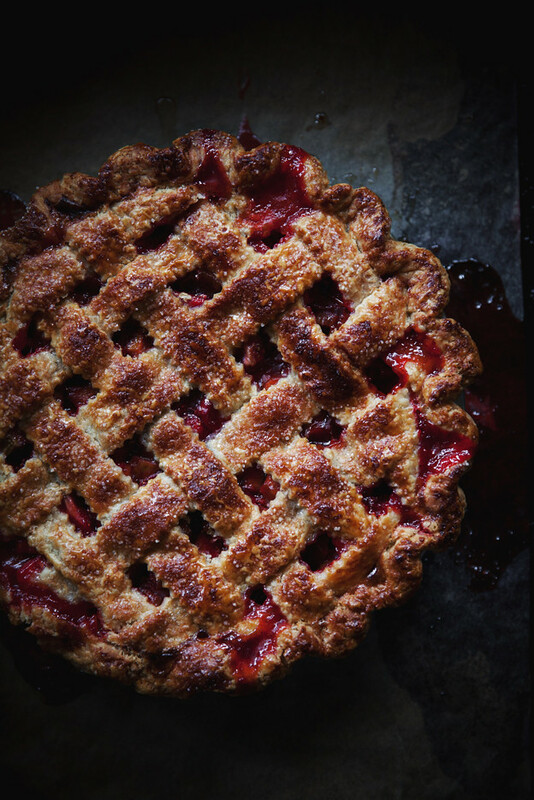 Remove the pie from the freezer and brush it with egg wash and sprinkle with turbinado sugar. 3. Place the pie in the oven, on the cookie sheet. Bake for 15 minutes at 225°C, then lower the temperature to 175°C (350°F). Bake until the edges are golden brown and filling bubbly, about an additional 45-50 minutes. If the pie is browning too much, cover loosely with aluminum foil. Let cool completely before serving with vanilla ice cream. Åhh tack så mycket Agnes <3 <3 Ja, prova! Tycker det funkar hur bra som helst! Kram! WOW. Your photo's are phenomenal!! 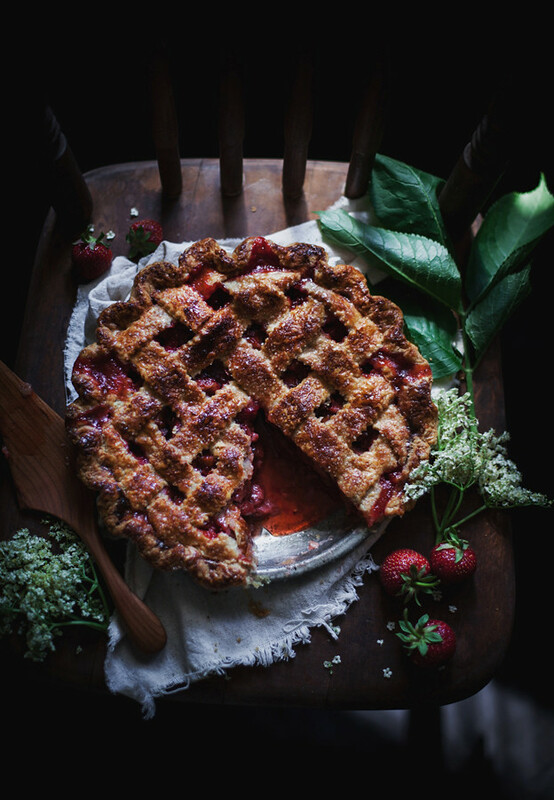 I haven't had a strawberry rhubarb pie in a loooong time, my mom used to make one of those upside down ones when I was younger… I totally fancy a slice now. Linda, your photos are stunning! 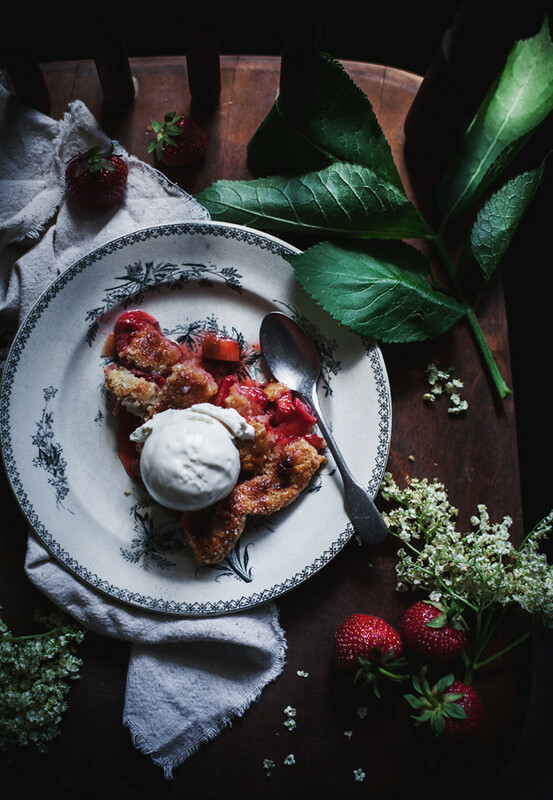 And there is nothing better than a strawberry rhubarb pie in the summer. How sweet you are, Ellie! Thank you ever so much :-* And it's true, I love it so much! Waiting impatiently french or english version of your new beautiful book to complete the collection! What a beautiful pie! It just feels like summer! This is absolutely gorgeous, Linda! Do I say this all the time? Well, maybe! But it is SO well deserved! 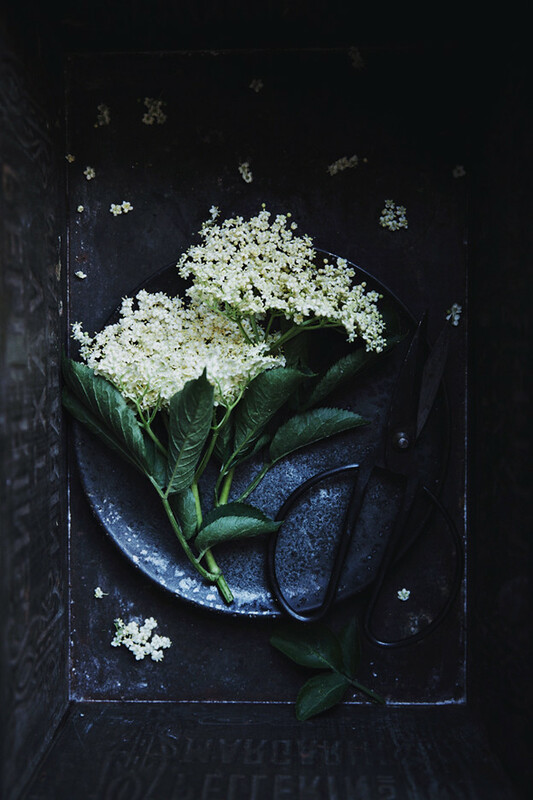 The elderflower is such a wonderful addition! This pie is lovely! Thank you, Katrina! It really was, I was almost surpassed how good it was with the strawberry and rhubarb! Thank you very much Linda for your lattice guide on video. It has been very useful to me. Yay birthday pie! Cause this post was on my birthday. I am totally loving the love and care that shows in the lattice work. 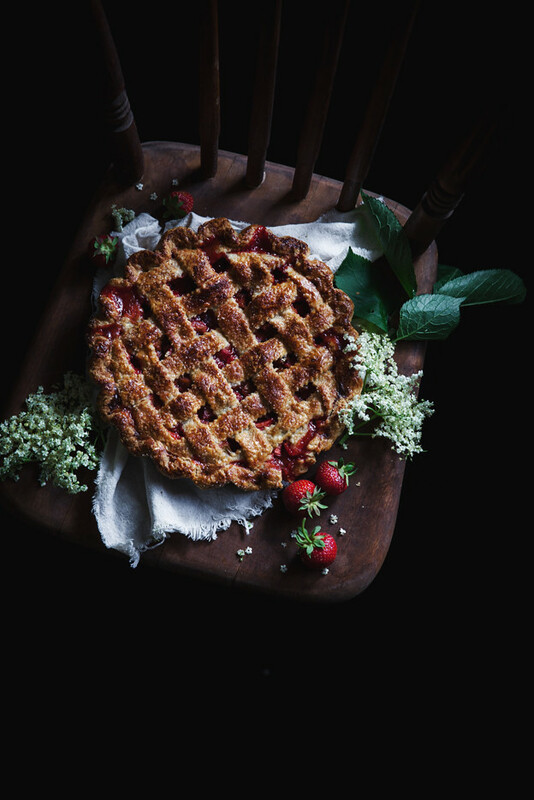 I have a pie to shoot this week and I have been practising from your video on IG. Thanks for sharing Linda. Always such an inspiration. Stunning pie, Linda! Your lattice is beautiful! you blog is so amazing, i love it so much ! This looks like a delicious recipe & your pictures are beautiful. I was wondering if I was to omit the elderflower & substitute with cinnamon, how much cinnamon would you suggest? Thank you! Wonderful pics as usual. 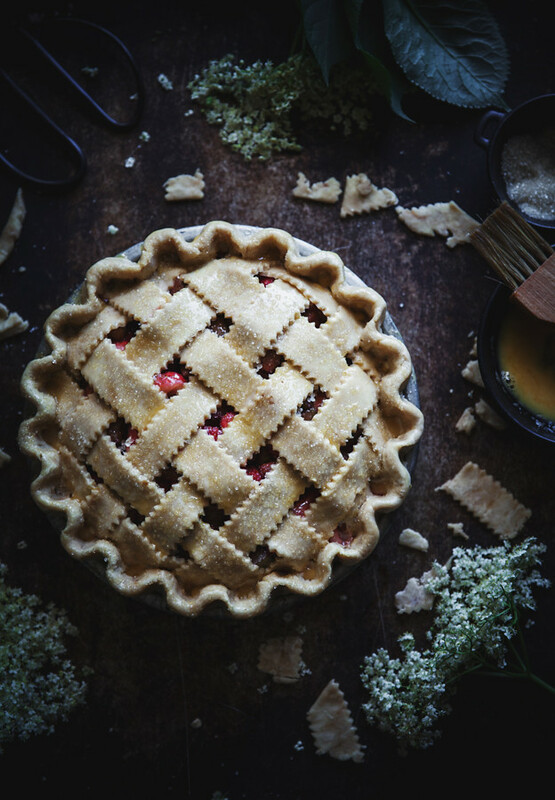 I love rhubarb and this pie look delicious! Beautiful photos, just admire how you style your sweets and cakes! Of course the recipe is great as well.